Devotion to Our Lady of Fernyhalgh goes back through the ages to the 11th century. Since the Reformation a devotion to Our Lady as Queen of Martyrs has developed, which is reflected at Ladyewell in the reliquary, the presence of the Burgess Altar and the chapel of the English Martyrs. There has never been an apparition of Our Blessed Lady at Fernyhalgh just continued prayer and petition over seven centuries. Even during penal times apart from a period of five years, the shrine attracted pilgrims and was the focus of local Catholic prayer. A secluded spot, only 4 miles from the centre of Preston and in close proximity to a very busy motorway, surrounded on three sides by ancient and protected woodland, Fernyhalgh has retained it tranquil and sylvan charm. The name Fernyhalgh is thought by some historians to mean Ancient Shrine. Professor E.J.Popham suggests that the place was called “ancient shrine” by Anglo Saxons because on this site was a shrine which even in their day was considered ancient, though this seems a tenuous link. The more feasible explanation is that of etymologist John Bannister who maintains “the name means a watery meadow abounding in ferns.” He goes on to say “halgh bears a similar meaning to the first syllable of Haighton, and is interchangeable with haugh”. “Fernig halth,” the Old English for “a field with ferns” would appear to confirm that this is the more likely meaning. The name Ladyewell, spelt originally Ladye Well, appears to have developed following the rebuilding of the present house in 1685. There was another Ladywell in the centre of Preston, which has long ceased to exist; the site of an old friary is remembered by the present day Ladyewell Street. 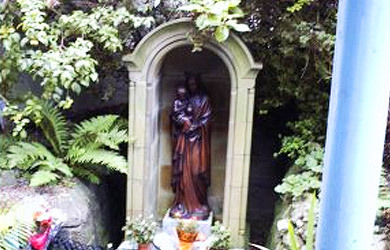 Local people tend to refer to Our Lady of Fernyhalgh, which is correct, but over the years the term Ladyewell has become used by those who visit particularly from away. In the writings of the priest Christopher Tuttell (alias Blacklow) the house and chapel was referred to as Ladyewell House, which is the case today. Pilgrims continue to make their way to this beautiful shrine where they intercede to Our Blessed Lady, bring their petitions and leave unburdened and spiritually renewed. Fernyhalgh is the Diocesan Shrine of Lancaster and encompasses the beautiful church of St Mary and Ladyewell House and grounds, which is the site of the well. The main pilgrimage season tends to run from May to the end of October, during which time the dioceses of Lancaster, Liverpool and Salford hold their annual pilgrimages to Ladyewell; pilgrims attend in large numbers and are usually led by the Archbishop or Bishop of the visiting group. 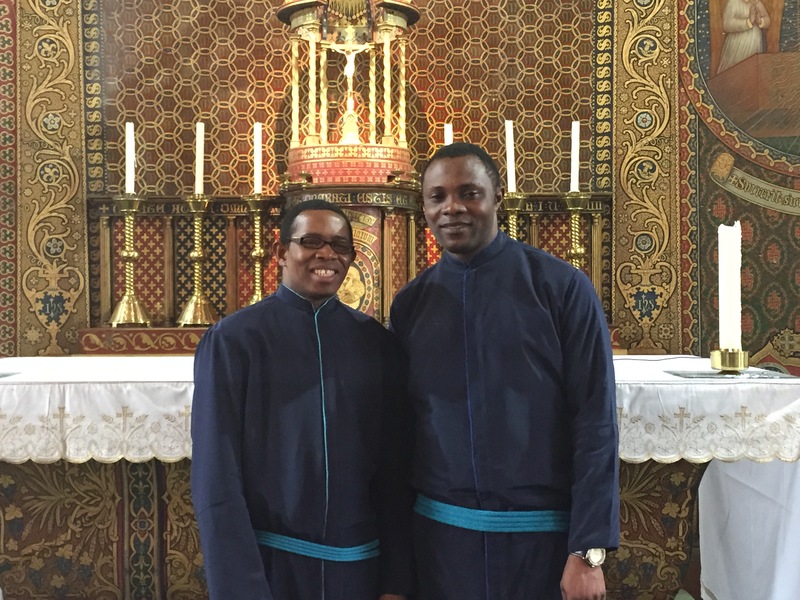 Catholics of the Syro-Malabar Church living in this part of Lancashire hold a service each month in their own rite. They have a great devotion to Our Blessed Lady and never a day goes by without members of this Catholic Indian community visiting. They pray often for the blessing of children and come back to give thanks usually on the way home from the maternity ward. Travelling families also visit Ladyewell, its proximity to the motorway enables them to call frequently en route often from Ireland, their names and faces are very familiar to us. Pilgrims come daily summer and winter whatever the weather. Even when the house is closed they come and intercede at the shrine, which is always open. 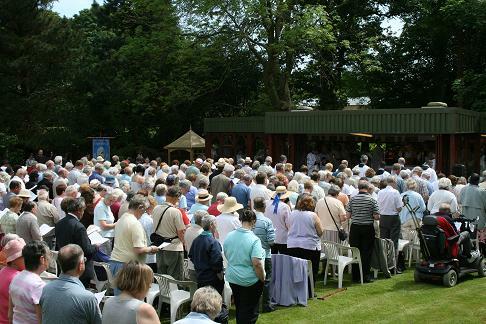 Large pilgrimages usually start with Mass at St Mary’s and then process down to Ladyewell either with the Blessed Sacrament or reciting the rosary. It is a moving and inspiring sight to see so many of the faithful, young, old and very often infirm gathering to honour the Mother of God in this particular way. Many of them recall being brought as children by their parents and recount of prayers answered and favours granted. 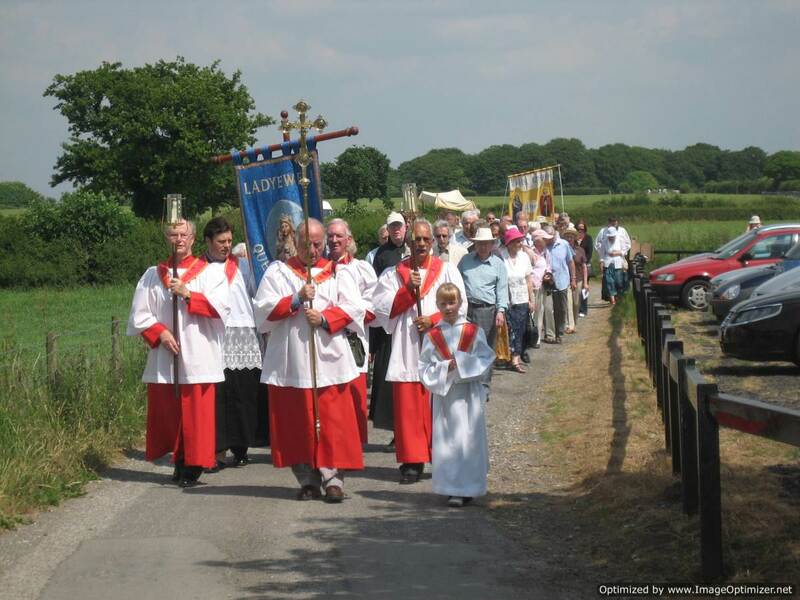 Local pilgrims remember coming as part of their own annual church pilgrimage, walking from Preston in procession to congregate and give homage to Our Blessed Lady of Fernyhalgh. Many parish groups of lay ministries and Catholic associations visit and have their own days of retreat and devotions. Exposition of the Blessed Sacrament and the sacrament of Reconciliation is an important feature of pilgrimage days enabling pilgrims to obtain the Spiritual rewards that they seek; they also take away with them water from the well and use it in invocation to Our Blessed Lady who inspires great devotion. “To Jesus through Mary” is so relevant at the shrine where those who may have strayed from their Faith often find the courage with the help of Our Lady to benefit from the peace of the sacrament of Reconciliation, which is available on request. Visitors to the Shrine and Exhibition are most welcome but larger groups of pilgrims are requested to telephone in advance.